Dr Denise Björkman, a local body language expert, looks at what the body language of State prosecutor Gerrie Nel and Oscar’s lawyer, Barry Roux, reveals. 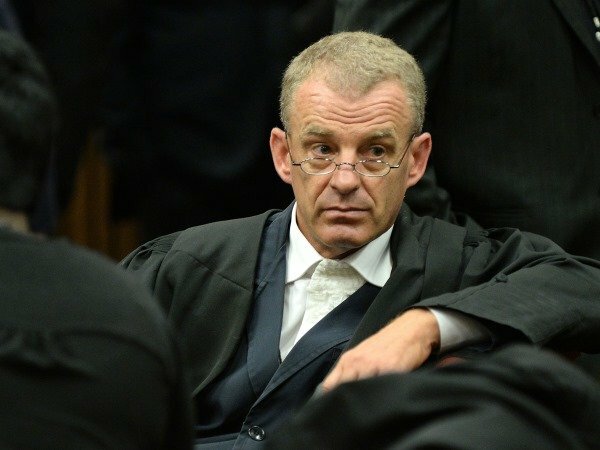 Gerrie Nel arrived three hours before the trial suggesting his skill at preparation. He is unpretentious and very focused which shows in his forward lean – a legal predator ready for careless prey. His facial features, pronounced nasio-labial folds (lines of cheeks) show intense concentration. Inattentive people lose these lines. His jawline is strong and determined. His eyes can be seen to flicker when he picks up on detail that is meaningful and his body posture and tension is one of high attention. Gerrie is seen to move fast and with purpose. The speed of his movement suggests equal speed and agility of mind and that he doesn’t suffer fools gladly. Gerrie speaks quickly and uses a lot of explosive sounds in his voice suggesting that he means business. This means he emphasises all sounds that cause breathing out and the control of space in contrast to weak presenters who use too many ‘sibilant’ sounds. His readiness to action is confirmed with his arms crossing as he reads out the charges. The speaking style of the defence and prosecution are in sharp contrast. The prosecution is strong, has volume, displays controlled aggression, it is controlled and purposeful. The defence is almost lyrical and emotional which may be a deliberate choice to defer to the judge and set the tone. Gerrie Nel, with his first witness, Michelle Burger, softens his voice which is likely to make it non-threatening. This is a good approach with a witness who may find the court daunting and it helps to draw out the witness where detail is required. It also helps to settle her into the witness stand. 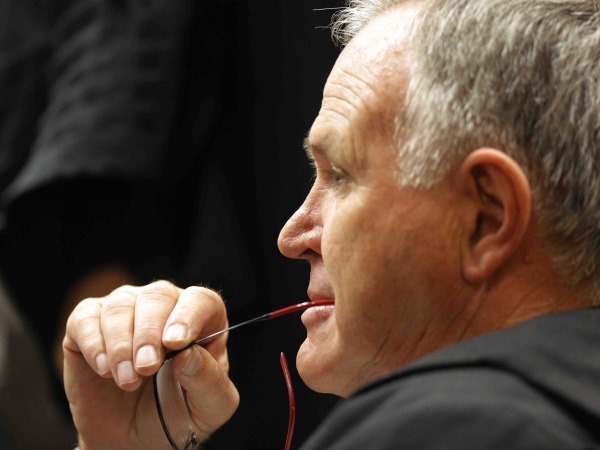 Barry Roux’ jaw line shows his capability for aggressive cross examination. The male hormone testosterone is usually responsible for highly defined jawline in younger men and sportsmen. In older men despite added flesh the jaw still moves aggressively. His mouth is not relaxed neither is his body. He has a greater need to express emotion through his hands than Gerrie Nel. The defence opened with a slightly sing song emotional voice that suggests an initial attempt to persuade and influence the audience. I would assume it is a deliberate ploy. Don’t see it as a sign of weakness. Barry Roux relies on irritation, sarcasm and belittling comments when he takes over his cross examination of Michelle Burger. His voice style has changed completely. His gestures underscore his sarcasm unlike Gerrie Nel’s more controlled style. He will take advantage of semantics and appears to be playing the male card when attacking the way a woman verbalises a traumatic experience. He has staying power that he uses tactically as his own signature as he dissects words which could weary even a resolute witness. This tactic is likely to appears throughout and suggests it is related to a strategic agenda for the final outcome.